Well I tried to look for a thread for Ivy Bridge overclocking but the last thread was closed to replies. Funny, I couldn't find another one here at TPU forums. Got the itch to overclock again today after a long hiatus (Diablo 3...). Batch#: 3231B415 - they had a lot of them. Needless to say, I'm McLovin' it! More long term testing to follow sooner or later, looks like I might be ordering some Cool Laboratory Liquid Pro! Seems like these newer Costa Rica batches coming out are incredible from what I've seen on other forums too! In the screenshot but Venomous-X with 2 fans (Enermax Magma). I had a "WHAT WHERE!!?" moment. In the notepad box duh... Thanks. Also in your sig. Nice results by the way. I am thinking I might get a 3770k next year if I can find one for cheap, maybe a 2600k. My 3700k survived the delidding surgery despite my scoring of the PCB with my X-Acto knife and exposing some yellow metal. Die Liquid Pro, IHS MX-4, resealed with Alumina thermal bonding compound. Highest difference 21c drop, lowest difference 15c drop, after 1 hour of Prime95. Says 66 deg F now. I see you put the IHS back on? Did you remove all the IHS glue, re-paste it with Coolaboratory Liquid Pro and just put the IHS back on in the socket, or did you do something else? I'd like to de-lid one of my 3770Ks because it runs at 82c on water under 100% load (not even IBT) at 4.3GHz/1.175v. Think that is 20 Celsius? A lot of ppl don't reseal - just liquid pro, ihs, and lock it down in the socket. I swap out CPU's every once in a while so I cleaned up the black silicone adhesive and resealed with Alumina thermal sealant for the IHS with Liquid Pro for the die. Im almost tempted to have someone pick me up a 3770k since it seems like Haswell won't be worth the wait. How would you know, since there is absolutely zero real information on Haswell. TPU posted an article and the information in it has been revealed as fake. I'm tempted to delid my 3770k... Mostly because my temps are pretty bad for what I'm using. Okay, might as well get the Liquid Pro.. Same here. I delidded a P4 540J earlier this week with a razor blade taken out of a box cutter, and it was pretty easy and the chip still works fine. I might try to find a thinner blade to delid with, though the one I used worked pretty well. I may do the same. Hey Erocker, do you have to put the lid back on or can you just thermalpaste and put waterblock on after delidding? And since you got the watercooling already, I'd go direct-die. Well, depending on your mounting system. See above. To use block directly, you need to remove mounting bracket on the board though. 3 hex screws, no big deal. YOU MUST USE collab Pro though, or don't bother. Putting IHS back on top, with coollab pro between IHS and die works really well too though, and is much simpler to manage. The only issue is that IHS will slide on die when you close moutnign bracket, so you need to offset it when you place it. Going on the side of caution I'd put the lid back on it. I've seen people cracking their dies... Don't want to do that. Best to glue it back on then. Would plain old silicone glue do the job for re-attaching the IHS to the chip? Also, how long does Liquid Pro typically last, or will it not need to be serviced until far into the future? 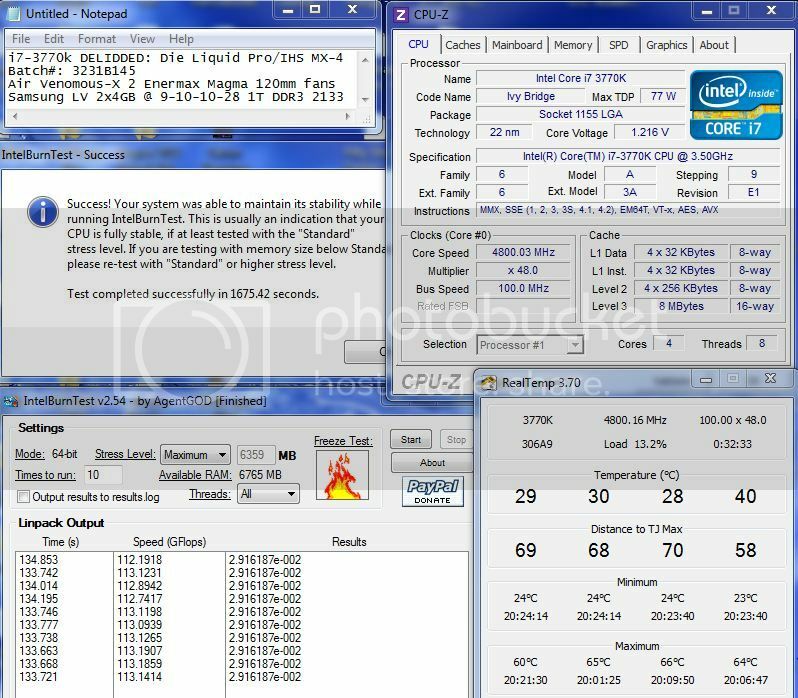 So those benchmarks revealed about 2 or 3 days ago have been said to be fake? I saw a twitter feed of a Intel engineer saying he has very different results on his haswell machine in his office. Before I saw that tweet though, I knew it was fake. The website the "leak" came from is new and not reputable. The interwebz is becoming filled with websites like this, that post BS in order to get viewcount up to make some quick case off of advertising revenue. No brainer. Wouldn't it be possible (with a bit of effort) to make something similar to what ATi/AMD and nVidia use for their GPUs? As far as I understand it, the point of a brace like that is to evenly distribute pressure so that the CPU die doesn't get chipped or cracked. I believe that even re-using the old heatspreader, while cutting a rectangular hole in it so that the CPU die is exposed, would be acceptable. One just needs to infer that the height difference between the top of the die and the top surface of the IHS is due to the height of the glue that holds the IHS. Use less glue (just a drop of non-conductive thermal glue, such as the one used for old chipset heatsinks, into each IHS corner) and it should work out fine. Not afraid of the big bad wolf anymore ...I would have never run IBT before with a highly overclocked 3770k on air cooling! Not even 70c on mid-high range air on a 4.8ghz 3770k on max settings!